32nd match of ICC Worldcup 2015 has been played between host team Australia and Sri Lanka at Sydney Cricket Ground today. Having won the toss Australia with helps of GJ Maxwell's superfast 102 runs of 53 balls put huge score of 376 runs for Sri Lanka to achieved. Sri Lanka all out scoring 312 rns and lost the macth by 64 runs. 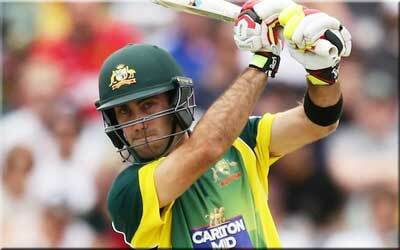 GJ Maxwell declared man of the match for his commanding inning of 102 runs just in 53 balls. Earlier, Australia won the toss and decided to bat first. Australian openers lost wickets early and at one stage Australia were 2/41. SPD Smith and skipper MJ Clarke took charge in hand and shaped up Australian inning well. both played goos cricket and made 72 and 68 runs respectively. In middle overs GJ Maxwell came in middle and played splendid inning of 102 runs of just 53 balls and SR Watson contributed well 67 runs of 41 balls in later overs. Australia managed to put huge totals of 376 runs at the end of 50 overs. Following huge target of 377 runs, Sri Lanka lost Thirimanne early scoring just 1 run. TM Dilshan and KC Sangakkara took the charge and played useful cricket for Sri Lanka. TM Dilshan made 62 runs and KC Sangakkar acontributed very well 104 runs before lost wicket. Skipper AD Mathews played well and made 35 runs. LD Chandimal also played quick inning of 52 runs of just 24 balls but, unfortunately got retired hurt in middle overs. Sri Lanka could not played quick cricket in later overs and lost the match by 64 runs.